Named after the River of Scarlet Macaw, Lapa Rios is a 930 acre private nature reserve located in Central America's last remaining lowland dense tropical rainforest. As we enter an oddly warm winter, many of us in richer nations will be thinking ahead to the next year’s holidays, keen to see the world but concerned about our impact. Because there’s no denying it: the footprint of the travel industry is heavy. Carbon emissions from planes criss crossing the skies contribute directly to global warming; natural resources are mined to build those all-encompassing resorts. Safari trails disrupt hunting habits - and habitats; litter, in countries with little infrastructure, pollutes landscapes. And profits from the resort don’t always go to those who need it most. The key is to understand how much could be achieved by really good tourism. “Tourism sector creates 10 per cent of the world’s jobs and GDP,” explains Vicky, who recommends the five eco-resorts below. “Which means it has the chance, like no other industry, to reach far into countries to preserve, support and create net positive impacts for conservation, communities and cultures.” Research and enjoy. The former palace of a local baron, Kasbah du Toubkal encouraged visitors to engage with its local Berber hosts. In the majestic Atlas Mountains, this award-winning mountain lodge lies just 60km from Marrakech. An iconic restored palace of a feudal caïd (local baron), it was renovated to support the health, wealth and well-being of the local village communities and environment, setting a sustainable development standard for Morocco. The Kasbah eschews the 4 or 5 star hotel approach, instead encouraging visitors to engage with its local Berber hosts. Over half of turnover is channelled towards local initiatives, such as their “Education for All” charity, which includes the construction of a school and support to enable young local girls to pursue their education with scholarships and high quality boarding houses away from home. Campi Ya Kanzi: One of the most unique and iconic soul journeys in Africa. Amidst the Chyulu Hills, Hemingway’s “Green Hills of Africa”, in a wildlife corridor between Tsavo and Amboseli National parks, lies Campi Ya Kanzi, the “Camp of the Hidden Treasure”. Created in true partnership with local Maasai, this community-run boutique ecolodge offers unparalleled luxury and broad balconies looking out onto Kilimanjaro. But stunning views are only a part of the story: Campi Ya Kanzi employs only local people and supports a community program of incredible social and environmental initiatives. To give an idea of the depth of the project, even the limited emissions produced from this alternative energy site are offset in the REDD+ Chyulu Carbon Project: a 30 year UN climate change mitigation programme. A daily conservation fee pays for loss of livestock to the pastoralists due to predator hunting – thus reducing human animal conflict and saving big cats. Campi Ya Kanzi remains one of the most unique and iconic soul journeys in Africa. Chumbe Island Coral Park: raising awareness nationally about the beauty, vulnerability and ecology of marine and forest ecosystems. Set off the coast of Zanzibar, Chumbe Island Coral Park is the first privately established and managed Marine Protected Area in the world, and the only one fully funded through ecotourism. 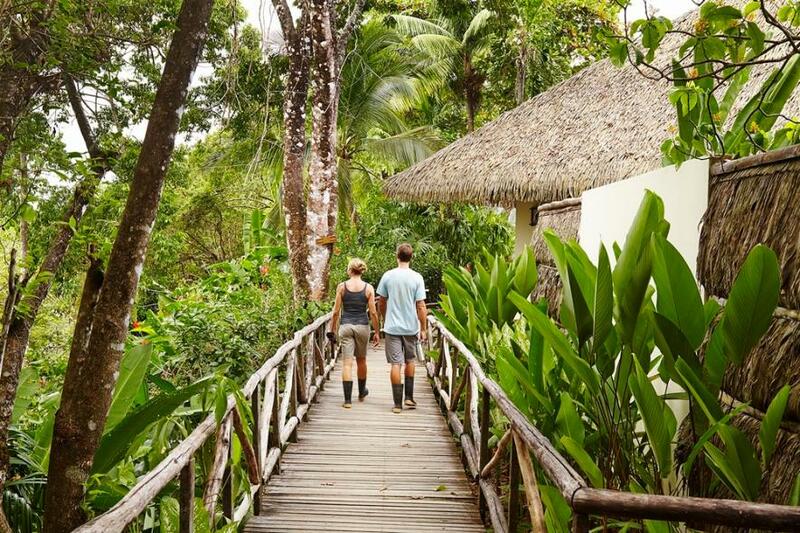 With just seven thatched-roof eco-bungalows or bandas, this award-winning ecolodge is set in rare wildlife forest nature reserve, 30 seconds from the beach and pristine coral reefs, offering rare natural beauty with privacy. The resort provides employment and training for local people as well as education for 6,500 school children, 1,100 teachers and 700 community members - including swimming lessons for Muslim girls! But the Park’s efforts go still further: raising awareness nationally about the beauty, vulnerability and ecology of marine and forest ecosystems and how sustainable tourism can create livelihoods. Wake to the sound of howler monkeys and watch the sun rise over the Golfo Dulce in Lapa Rios. Named after the River of Scarlet Macaw, Lapa Rios is a 930 acre private nature reserve located at the southern-most tip of the Osa Peninsula, Central America's last remaining lowland dense tropical rainforest. Lapa Rios is estimated to be home to almost 2.5% of the biodiversity of the whole world, although the primary rainforest is so dense it is difficult to count exactly! Costa Rica itself is certainly known as a living laboratory, and 319 of its 850 species of birds live here. The reserve is exclusive to registered guests, which means full immersion. Beautiful bungalows are designed for utmost privacy. Wake to the sound of howler monkeys and watch the sun rise over the Golfo Dulce, as Scarlet Macaw stream over the canopy. Relax in hammocks, take a dip in the the natural spa or join a yoga class. Activities including beach cleaning, night walks in the rainforest, responsible whale and dolphin watching, visiting local artisans and farms support the reserve’s ongoing vision: “A tree left standing is worth more than one cut down” as well as maintenance and land preservation, biodiversity and local communities. The famous Machhapuchhare Peak is reflected in the retreat’s infinity pool. On a mountain ridge 1000ft above the Pokhara valley, the gate way to the famous Annapurna Circuit, this homely retreat - opened by Sir Edmund Hillary - is perfect for privacy and contemplation. Hilltop gardens, staggering views and a secluded infinity swimming pool which reflects the famous Machhapuchhare peak provide perfect pre- or post-trek tranquility. The Lodge sees itself as an interface between the community and guests, believing in a two-way flow of mutual support, raising understanding of the lodge’s responsible tourism activities within the community through its local staff. The local community is consulted whenever Lodge activities may have an impact and support is offered to local health and education services. Little wonder that most of the staff formed part of the lodge’s original construction team, and 97% of the staff have been with the lodge over 8 years.